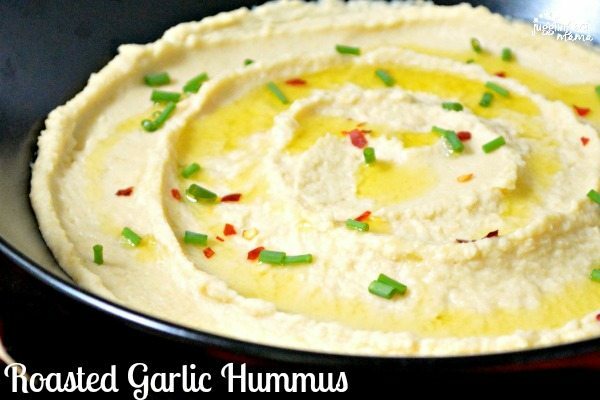 This recipe for Roasted Garlic Hummus is a winner you’ll want to keep! Roasted Garlic Hummus is a delicious and healthy appetizer and snack for parties, or even for school lunches! 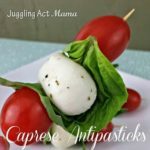 This recipe couldn’t be more simple – you’re going to love it! This Roasted Garlic Hummus recipe is so good you’re going to want to make it again and again. It’s perfect for parties or even a casual date night at home. (Don’t worry, two garlic breaths cancel each other out!) You just need a few simple ingredients, so this is great to whip up for last minute get-togethers. One of my favorite things to do toward the end of the week when I’m tired and, well, a little lazy, is to have appetizers for dinner. I’m not talking about mozzarella sticks and chicken wings though. I get out my big cutting board and fill it with all kinds of tempting nibbles like slices of cucumbers, carrot sticks, dried apricots, cheese and crackers, grapes, pepperoni, apple wedges, and a variety of dipping condiments like peanut butter, ranch dressing and hummus. This is a pretty simple way to entertain guests, too! What Makes Hummus Good For You? The main ingredient in any hummus recipe is chickpeas. They are high in iron and B vitamins. This recipe also includes lemon, which of course has a high level of vitamin C. Adding the yummy roasted garlic boosts booth vitamins C and B6. 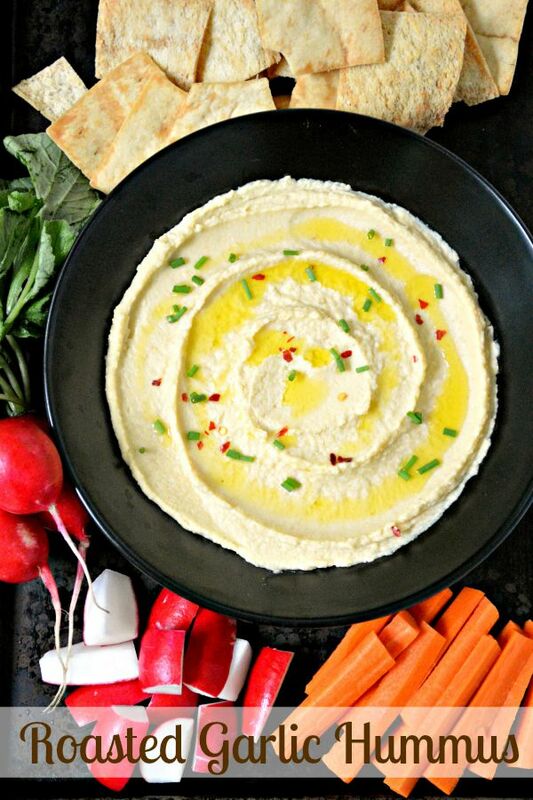 Hummus as dip or spread is a great snack because its high in fiber, antioxidants and protein. 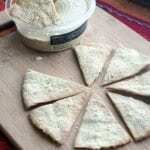 This is the homemade pita chips that I use. This is totally the best garlic hummus recipe you’ve ever tried, and it’s because of the roasted garlic. Line a baking sheet with parchment or tinfoil. Cut the top off the head of garlic and put it on the prepared sheet. Drizzle with olive oil and use your fingers or a pastry brush to rub it all over the exposed part of the garlic. Cover the bulb of garlic with a piece of tinfoil. Bake for 30-35 minutes until the garlic is soft and golden. If you’re not up for this step, skip it! 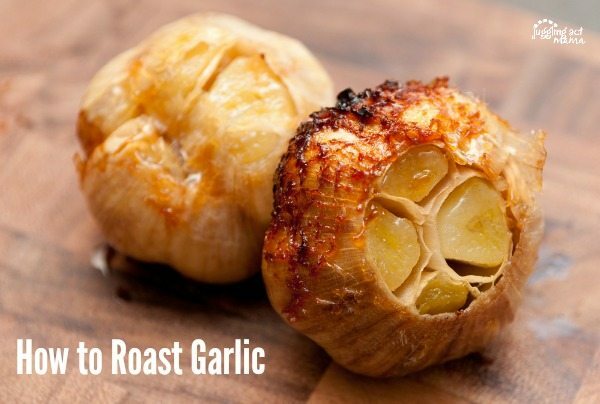 Your local grocery store may have freshly roasted garlic available. Check the salad bar area. At my store, there’s an antipasto type bar with olives, marinated mozzarella and loads of roasted garlic! Tahini is optional in this recipe, but I strongly recommend it. It’s basically sesame seed butter and it adds a lot of flavor to your hummus. 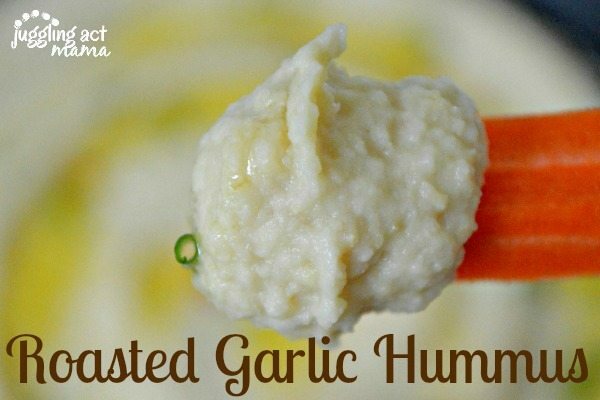 Creamy delicious roasted garlic hummus is an easy addition to any appetizer spread! Place the head of garlic on top of a sheet of foil and drizzle olive oil over the garlic. Wrap in the foil and bake for about 40 minutes. Carefully remove the skin and discard. Keep the roasted cloves for the hummus. In a food processor, combine the chickpeas, lemon juice, salt, pepper, tahini, cumin and pulse for a couple of minutes. Scrape down the sides and bottom of the food processor. Pulse again for another minute and scrape down the sides once again. Add the olive oil and all the cloves of garlic, Pulse again in the food processor until smooth and creamy and add additional olive oil as needed. Serve in a dish and drizzle with extra olive oil. Garnish with red pepper flakes and chopped chives, if desired. What Flavors can you add to Hummus? To make this garlic hummus spicy, add roasted red jalapenos to taste. Chop 1/2 cup of sun-dried tomatoes and a couple of fresh basil leaves. Stir the sun-dried tomatoes and basil into the hummus. Add 1-2 teaspoons curry powder to your hummus. Toast pine nuts in a skillet and stir them into the hummus. Garnish with parsley. 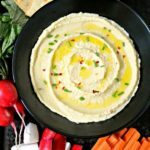 What is Good to Eat with Hummus? Blend hummus with olive oil and lemon juice to make an easy dressing. Use it instead of mayo or mustard on a sandwich. Try dipping fresh fruit like apple slices or dates instead of just veggies. Replace sour cream in your mashed potatoes with hummus. 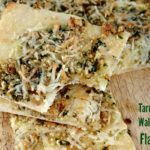 Your family and friends will love this tasty dish! Be sure to pin the recipe for later. This looks absolutely amazing! I’d love all of the ideas you’ve presented to go along with this also. Are usually just choose pita chips! Now I have lots more possibilities!